Never would I have believed in a million years that I would be cooking a whole chicken in the microwave! Never would I have believed that the chicken would be moist and delicious! But yet, here I am rocking my Rockcrok from Pampered Chef life a boss! But I had yet to learn about the Rockcrok 30 Minute Whole Roasted Chicken! I freaking love it! Quick 30-minute chicken in my RockCrok from Pampered Chef! Rubbed down with garlic and herb rub! With a simple 5 minute prep, amazing herb rub, and 25 minutes cook-time, this Chicken Recipe is amazing! I can remember making my first Pampered Chef chicken and was very wary about cooking it properly. 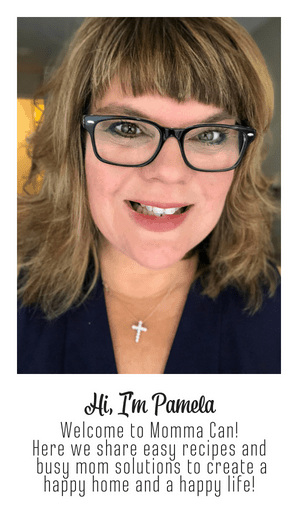 Watching about a million you-tube videos and looking at my Pampered Chef recipe with my best pair of reading glasses over and over again I got the courage to give it a try. Grabbing my ingredients, I put the recipe together, and placed in the microwave. The timer went off, I poke my digital read thermometer in several places and decided to zap it on high in the microwave a little bit longer. I learned that micro-roasting a supersize chicken needed a little more cooking time. After 5 more minutes, the chicken was at 165 degrees Fahrenheit. I popped it out onto the counter, set it on top of a large cutting board still in the Rockcrok and covered with a cheesecloth towel. I waited, 10 solid minutes. The resting period of that bird was the most difficult. The chicken looked so amazing when I pulled it out of the oven. My tummy did that crazy grumble and my mouth was watering. I was ready to eat! Ding! The timer finally allowed me a taste! I cut into the thick breast and the juices flowed clear. The first taste was the best, the chicken was moist and the seasoning just perfect. I had to put my fork down, lest my family have nothing to eat for dinner! My Family Loved the Rockcrok Chicken! Everyone loved the chicken. We revisit this recipe often. Cooking a whole chicken in the microwave is a real gift in hot climates. Nobody wants to be in a hot kitchen babysitting a roast chicken for two hours! 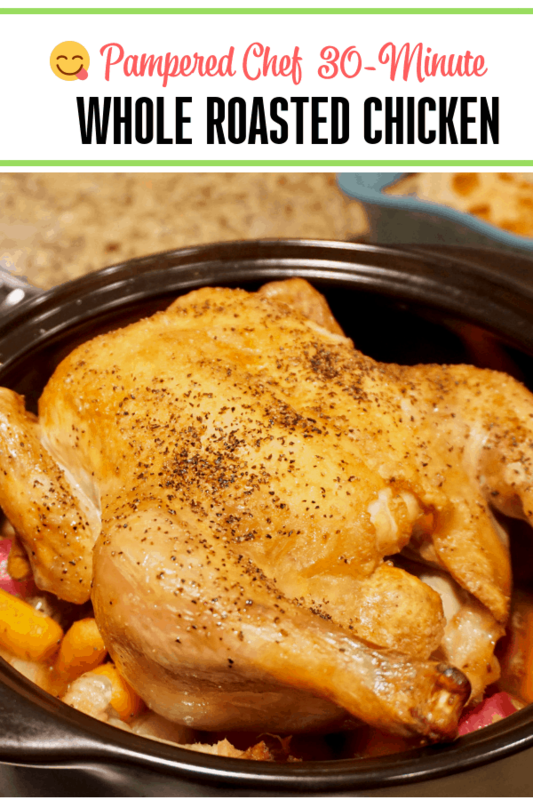 I totally recommend the Rockcrok 30 Minute Whole Roasted Chicken for busy dinner nights! I used the Rockcrok Dutch Oven! You can find it here! Please Remember to Only Use Microwave Safe Dishes In the Microwave! If you love this recipe, you might love our yummy Turkey Chili Recipe! Quick 30-minute chicken in my RockCrok from Pampered Chef! and tuck under chicken. Baste chicken with olive oil. Mix seasoning and flour then coat outside of chicken. Place chicken breast side up into crock. Microwave on high 25- 30 minutes until thermometers reachers temperature of 165 degrees Fahrenheit. Remove and cover for 10 minutes. 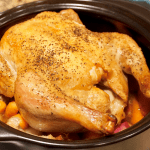 This is an important step to finish the cooking process and to keep your yummy chicken moist! You can make this with Jerk Seasoning and it is just as amazing! I have never heard of the Rockcrok…I just may have to invest in one! This is cooking as we speak! I am a PC consultant and absolutely LOVE this product! I was excited to come across your blog and then to see this!? Happy Thursday! When was this written? Wondering if you loved the results? I loved the results! I was reluctant to switch from the other PC I was using but I was loving the idea of the easy clean up. So I switched and am really happy. I believe I bought the newer one when I did the turkey chili recipe, but I can’t recall.